It is an action filled movie, not quiet what you might expect if you have seen or read anything about Sherlock Holmes previously. 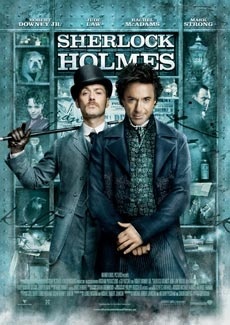 We meet Sherlock Holmes (Robert Downey Jr.) and his companion Dr. Watson (Jude Law) when they are about to close up a case, catching an occult serial killer, Lord Blackwood (Mark Strong). They catch up with Blackwood just in time to save his intended victim from being killed as a scarification. Lord Blackwood is sentenced to death by hanging, and his death sentence is carried out, or is it really?